Our specialty!! Of the 150 plus tours we operate per year, the 1500+ passengers per year who travel with us, this is 80% of all our departures. We average 50% Snorkelers and 50% Certified divers. Departing Marlin Marina, Cairns, Queensland, by 7.30 am you get to spend over 24 hours on the Great Barrier Reef itself - 11.00 am till 11.45 am the next day! That's 2 full days and 1 night aboard, "Sleeping on the Reef". Returns Cairns approx. 3.00 pm next day. Departing Tuesdays, Thursdays and Saturdays, we arrive at the Outer Barrier Reefs (Thetford or Moore Reefs) for up to 4 different snorkeling sites. 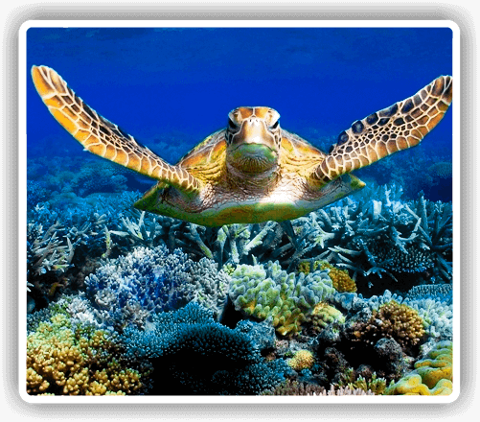 We love these reefs the best due to their great coral coverage and fish life. Depth to the top of the reefs range from less than a meter to 3m dependent on the weather and tides. Perfect for snorkeling. This tour caters very well for swimmers and non swimmers, those who have not dived and what to give it a go, and to all wanting to say they have snorkeled and scuba dived the Great Barrier Reef. A Snorkel and Introductory Dive Briefing is given during the journey out and we are ready to snorkel or dive by the time we arrive at our first Site. All you need to do is grab your gear and jump into the water to see the beauty of the Great Barrier Reef. *Reef Tax : Admin fee, Port Charge and Fuel Levy and GBRMPA (EMC $6.50/day). 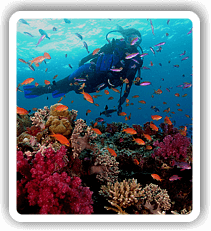 • Three Consecutive Intro Dive Package - $90. swimwear, sunscreen, hat, seasickness tablets and camera. Day 1: Cairns to Outer Reef. Passengers meet at the company office (Rum Runner - Marlin Marina, E finger, Berth 3) by 7.00 am for an approximate 7.30 am departure. Passengers are briefed as to the itinerary and safety aspects of the trip and boat, and the dive equipment is organized, making it ready for your arrival at the Reef. Passengers are welcome to join in, grab a line and hoist a sail alongside the crew. From 11.00 am : Arrive at Thetford Reef. 4 dives and snorkeling sessions. Arriving at Thetford Reef the Dive Instructor will brief everyone on general dive safety and details of the first dive site. Diving will be tailored to suit individual experience levels. If anyone is a bit rusty one of the crew will accompany him or her on their first dive if they wish, guided dives can be arranged if required. It is time for some of the best diving and snorkeling in the world; Sites include The Labyrinth, the Lagoon, Hurricane Bay, Coral Gardens ; from shallow coral gardens, isolated pinnacles to caverns, swim through's and spectacular walls. Dinner is served as you watch the sun setting over the mountains behind Cairns. Guests can relax, have a few social drinks and get to know each other as the certified divers get ready for the night dive. Evenings are a relaxed affair, with just a chat and a few drinks on deck while at anchor in the calm water of the company's protected night moorings. In calm clear weather, the stars over the Great Barrier Reef are an awesome sight. Day 2 mornings: 2 dives and snorkel sessions are on offer. An invigorating morning dive and snorkel, before a hearty breakfast sees the start to a day of diving & exploring. Last dive includes swim-through's and caverns, then a quick lunch break before heading off before noon. 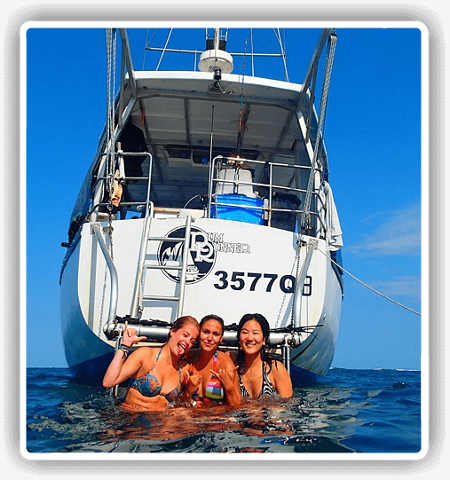 Now before departing the Reef for a sail to the tropical city of Cairns, finish the trip with the a couple of drinks going over the photos and videos with your fellow divers and snorkelers. Day 2 afternoon: Return to Cairns. As you sail back through the Barrier Reef, you can watch out for dolphins or whales, and see Queensland's tallest mountains. just gorgeous, or you can just relax on deck until you feel like getting up, laying around while the boat sails back into Cairns. Arrive at Cairns at 3.00 pm . Later in the evening meet with your new friends and fellow divers for a night out in Cairns. Started in the early 1990's, S.V. Rum Runner was sailed to Cairns and refitted to fit 20 divers, out to 200 Nm from the Coast survey. She is still the first Coral Sea diving vessel operation from Cairns. In late 2005, Rum Runner was brought by Cairns Discount Diving Pty Ltd, and put back into service for the overnight GBR market (Great Barrier Reef - Cairns section) , and has been available for Charter's to the Coral Sea Reefs and GBR Ribbon Reefs for the past 12 years. The boat will accommodate up to 16 guests in twin and 4-share cabins, with the berths in each cabin set up single bunk style. As typical for anyone familiar with sailboats, the cabins are not spacious or very private; they are for resting and sleeping only. The common areas include a dining area and both covered and open decks. 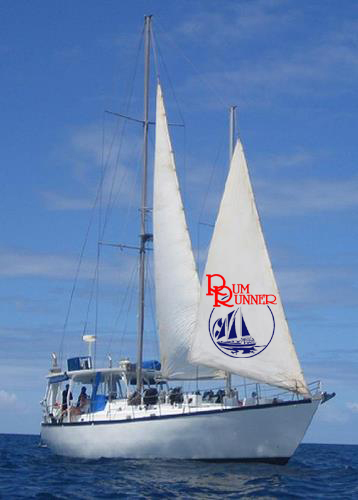 Overall, Rum Runner is a comfortable sailboat, well suited for adventurous divers. It is by no means a luxury liveaboard boat. Those seeking privacy and luxury should consider trips on other vessels. ...Not so good for: wrecks, cave diving, very deep diving, shark sightings but it is possible. .. The snorkeling and diving in this, Australia's Great Barrier reefs, is highly rated with good visibility and a wide range of topography. You can expect shallow reefs with giant clams and beautiful corals, wall dives, swim through's, and some of the best night dives the barrier reef has to offer. Caverns are covered in bright and colorful soft corals, tall bommies are patrolled by an impressive array of fishes, and there are large archway swim through's. 3.5 million years Coral Sea Reefs were similar in coral coverage of today's very magnificent Great Barrier Reef. When the GBR was being formed 300,000 years ago, the Coral Sea Reefs were an important source of Coral for the GBR, both during the the GBR formation and during sea level lowering. Technically, the Coral Sea reefs and Islands are not a part of the Great Barrier Reef; they lie from 60 - 400 km outside of the GBR boundaries. Yet, even though both are different ecosystems, they form a largest mega system of corals found on the planet. Of the 2500 species corals in the world, 1400 are found in the nutrient rich waters of the GBR and Queensland coast, and with a few hundred of these found in the Coral Sea reefs. And even though the GBR is now under tremendous stresses from climate change, it is still the GBR that offers snorkelers and divers the most diverse array of coral formations and small tropical fish species on the planet. The wall itself is home to a number of cavernous arches and swim-throughs between around 5 and 10m depth. Many are easily penetrated despite the thick bushy covering of soft corals. Within the arches look out for lots of lobsters and other crustaceans in the nooks and crannies, where a keen eye might also spot a stubby tail eel. Meanwhile, as you are poking around in the recesses, turtles and potato cod are always likely to put in an appearance, cruising by, casting a curious glance or two in your direction. Pinnacles - This is a two bommie, or 2 pinnacles, that rises from 25 m depth to 4m from the surface, one of which has split in 2, creating a canyon between the 2 fingers. The crack is full of vibrant and huge orange and yellow sea fans and all sort of soft corals. With your boat moored to the top of the bommie you will start this dive by sinking down to near the base and working your way back up. You can encounter giant trevally at both the tip and base of the bommie. Conditions are usually calm, making this one of the easier dives at Thetford Reef. Look out for larger creatures like tuna, turtles, white tip or grey reef sharks and occasionally even Minke Whales. Smaller delights include clownfish, nudibranchs, long-nose hawkfish, pyramid butterflyfish, blackspot angelfish and fairy basslets and damselfish particularly near the tip. The Wildside - Unsurprisingly this dive site features a deep drop-off. This steep wall plummets to depths of over 30m! Sticking to the sun-drenched shallows you can enjoy the myriad reef life on a very pleasant drift dive. The wildside is among the most popular dive sites of Thetford Reef although it can only be dived in relatively calm weather. Provided the conditions permit, you will be in for a treat, drifting along past a rich wall with hard and soft corals galore as well as giant clams in rude health. Canyons and Deep Bommie - Another Thetford Reef dive site with a rather dramatic name is the impressive Canyons. Similar in profile to The Wild Side, the wall here sinks down 30m metres to the sea floor. Impressive hard and soft corals are matched by the meaty pelagic encounters likely here. You can expect the usual encounters with grey reef sharks, white tip reef sharks, and turtles as well as tuna and potato cod. Also likely here are Napoleon wrasses, known in this part of the world as Maori wrasses. Turtles 360 - No prizes for guessing the creature that this site promises more than any other Thetford reef site. Different in profile to some of the other sites here, Turtles 360 is a series of shallow bommies on the edge of the reef. The sandy floor from which the bommies rise, is home to garden eels and resting white tip reef sharks. Potato cod and turtles are on the menu especially in the shallower sections. There is also plenty to see in terms of macro life and around the reef. Crustaceans abound in this site which is 1 of several here that make great night dives. Cleaner shrimp, Saron shrimp and Bumble Bee squat lobsters are among the more interesting residents. Good visibility is common here making Turtle a favourite site for underwater photographers. Liveaboard diving cruises to the Reef are in high demand and fill up quickly. We recommend you plan to book well in advance. Currents: Normally gentle, can be slight. Included: 2 dives, Tanks, weights, air fills; All bedding linen, All meals, Light refreshments provided after dives Coffee, tea, hot chocolate, Tap drinking water. Email or Call for further details about this special deals.